Those sunny summer days are what we wait for all year. The chance to get outdoors and fill your weekends with fun activities. But what we quickly forget is how our pets deal with the hot temperatures and how in the blazing sun things can often be forgotten. Like how to properly care for your pet during the hot summer days and what you can do to make it a little easier on them. Although the most obvious and seemingly goes without saying, but you should never leave your pet inside a locked car. Temperatures can reach a staggering 100 degrees in just minutes, even with the windows cracked and the A/C pumping. Be prepared before you leave your house with your pet for any unscheduled stops. Make sure that you walk your dog when its cooler, say early morning or later in the evening. Not only will the hot temperatures cause your pets to become dehydrated but can cause serious damage to the pads of their paws from hot concrete. If you are planning on spending the better part of the day outside with your pet, seek out a nice shaded area to help protect against the heat. If there isn’t much shade to be found remember to give them frequent breaks from running or playing. 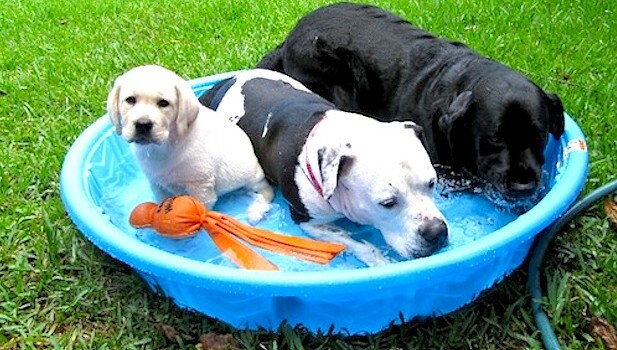 Come prepared with fresh cool water for your pet to drink. Whether you are going for a walk or out playing in the park. Pack a portable water dish along with a small cooler filled with water before you leave the house. Lack of water can cause dehydration and stroke for both you and your furry friend. Telling the signs of stroke can be tricky, but even more so when it comes to your pet. Remember that older or overweight pets can capitulate to heatstroke faster than their younger more athletic counterparts.